In December, Stanbridge College Information Technology students prepared 28 PC computers for needy children in Costa Mesa. Over 15 students worked to set up each computer for the children to use. 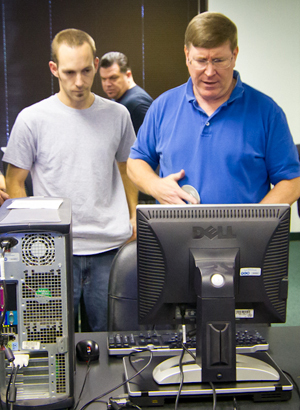 Students wiped hard drives and installed device drivers, operating systems and the Microsoft Office suite. The computers were previously donated from a former bank, and will be distributed through a local church to the children during the Christmas holiday. In order to receive a computer, each child will need to volunteer or participate in community service at their school. Stanbridge College IT students and staff work together to prepare computer donations for OC children in need. for the students working on the PCs, the church to be able to provide the PCs, and the community to receive the PCs. The project is part of the Stanbridge College REACH – Beyond the Classroom™ Service Learning Initiative in which students are encourage to use their technical skills to help those in need in the community. In the past, IT students have worked with non-profit organizations including the Boys Hope, Girls Hope in Costa Mesa setting up a computer lab for the at-risk children. Earlier in 2012, Stanbridge College signed a partnership with NPower Community Corps to provide pro bono IT support to nonprofits and schools. The partnership with The Community Corps program will enable students in IT programs at Stanbridge College to work directly with IT professionals to support nonprofits with IT support and services. To learn more about community service and service learning at Stanbridge College, please visit www.stanbridge.edu/reach.